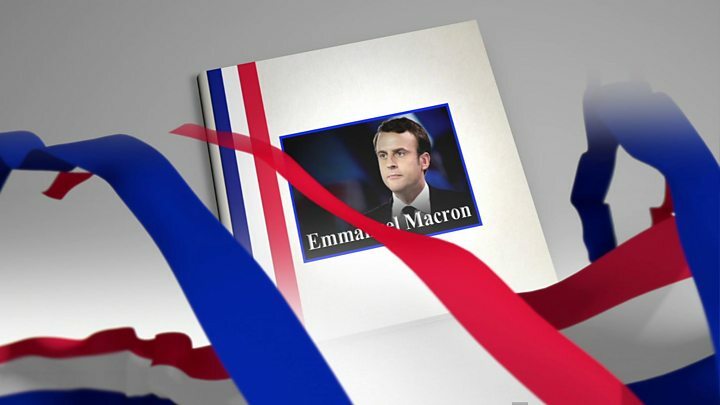 Emmanuel Macron has vowed to fight "the forces of division that undermine France" after easily winning the run-off election for the French presidency. The centrist candidate, 39, defeated the far right's Marine Le Pen, winning 66.1% of the vote to her 33.9%. 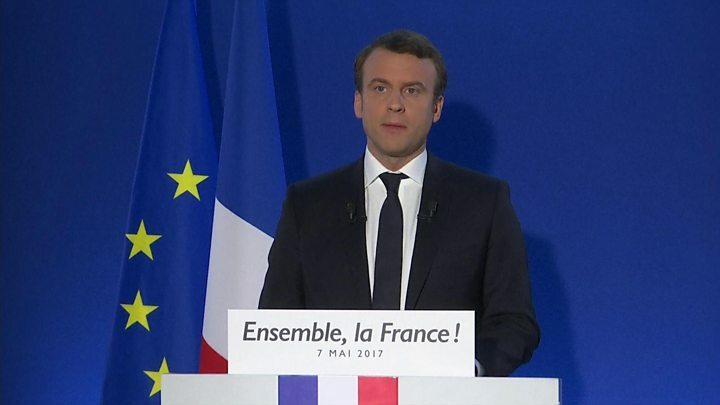 Acknowledging his victory, Mr Macron told supporters he wanted to ensure Le Pen voters "no longer have a reason to vote for an extremist position". The sense of relief among European Union leaders has been palpable. What do world leaders think? Mr Macron was elected on a pro-EU platform, while Ms Le Pen by contrast threatened to pull out of the single currency and hold an in/out referendum on France's membership of the EU. In a speech to jubilant supporters, Mr Macron said: "Tonight you won, France won. Everyone told us it was impossible, but they don't know France." 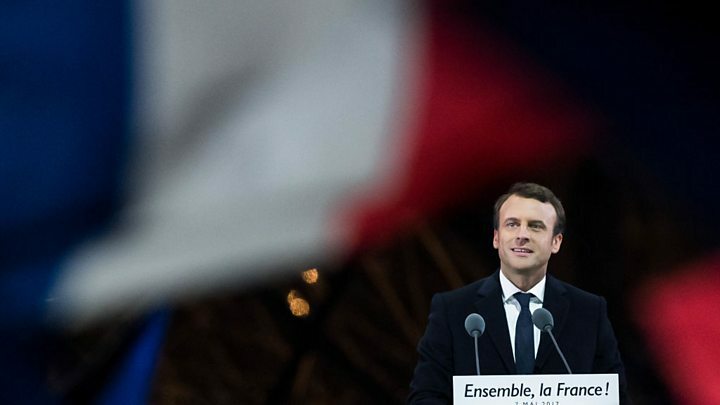 His win makes him France's youngest president and overturns the decades-long dominance of France's two main political parties. But huge challenges remain, with a third of those who voted choosing Ms Le Pen, 48, and even more abstaining or casting a blank ballot. Mr Macron said he had heard "the rage, anxiety and doubt that a lot of you have expressed", vowing to spend his five years in office "fighting the forces of division that undermine France". He will be sworn in on Sunday, outgoing President François Hollande said. Emmanuel Macron inherits one of the most powerful positions in Europe, and all the symbolism that comes with it. This morning at the Arc de Triomphe, he showed no sign of being awed by his new job. He walked alongside the outgoing President François Hollande as the two laid a wreath at the Tomb of the Unknown Soldier. The two then shook hands with veterans. Mr Macron appeared to take longer to make his way through one receiving line, stopping to talk to elderly men, leaving Mr Hollande to wait for him at the end. Emmanuel Macron now becomes France's youngest leader since Napoleon Bonaparte, whose battles are commemorated at the Arc de Triomphe. The new president will hope that his own fights are less bloody. Most of those running the EU were breathing a sigh of relief, given Ms Le Pen's policies and last year's Brexit vote. European Commission chief Jean-Claude Juncker tweeted "happy that the French chose a European future" while German Chancellor Angela Merkel said Mr Macron "carries the hopes of millions of French people, and of many people in Germany and the whole of Europe". US President Donald Trump, who previously praised Ms Le Pen, tweeted his congratulations to Mr Macron for the "big win" and said he looked forward to working with him. Russian President Vladimir Putin said amid the "growing threat of terrorism and violent extremism" it was important to "join forces to ensure international stability and security". What are Macron's main challenges? With parliamentary elections in June, he will be campaigning on behalf of his new movement En Marche (On The Move) to get the seats he needs to pursue his legislative agenda. The grouping, founded just over a year ago, does not yet have a presence in parliament. If he cannot gain a majority he may have to form a coalition. His campaign pledges included cutting 120,000 public-sector jobs, reducing public spending by €60bn (£50bn; $65bn), and lowering the unemployment rate from its current level of about 10% to below 7%. What are his economic plans? Where does this leave Le Pen? She won almost double the tally her father Jean-Marie won in 2002, the last time a far-right candidate made the French presidential run-off. Although she performed worse than final polls had indicated, her anti-globalisation, anti-immigrant, high-spending manifesto attracted an estimated 11 million votes. She said the election had shown a division between "patriots and globalists" and called for the emergence of a new political force. Ms Le Pen said her National Front party needed to renew itself and that she would start the "deep transformation of our movement", vowing to lead it into next month's parliamentary elections.